HOW TO PREVENT OR CORRECT BRASSY HAIR! I can sing a song about brassy hair! It has happened to me many times. I have naturally dark blonde hair, but prefer to lighten it up. It seems that I have some red under-tones in my hair and so it happens to be that my hair ends up many times looking brassy- meaning having that totally undesired orangey tone to it. But I have also managed to find products that can help me with that! So today I have for you my best tips on how to prevent or correct brassy hair! 1. Choose the right color! I can´t stress this enough but it is so super important to pick the right color. If you want to lighten your hair more than 3 shades, chances are that it will get brassy! So, I usually don´t try to lighten my hair up too much - if you want it lighter than 3 shades, do it in slow steps: lighten your hair 3 shades lighter, after 4 weeks go even lighter and so forth, if you will. Give your hair some rest in between. This process will take sometime, but your hair will thank you for it! Also: if you have red under-tones like me (if you tend to get brassy hair then this is probably the case), pick a "cool color". Loreal Preference always makes it easy as they label their boxes with "Warm", "Natural" or "Cooler". 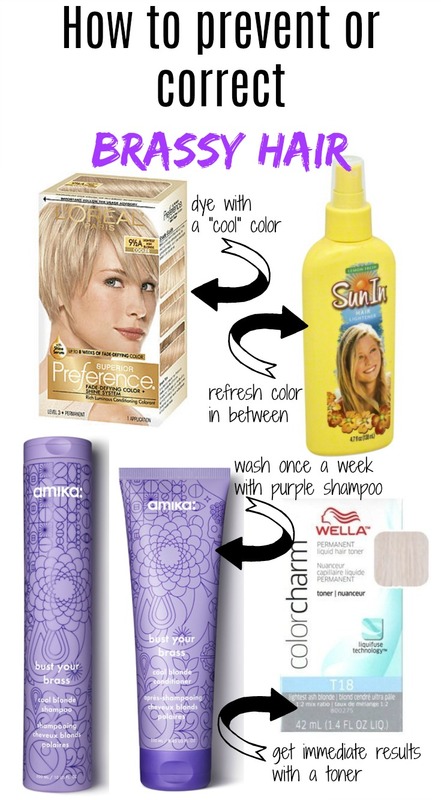 Pick "Cooler" or "Ashy colors" if you don´t want brassy hair! I happen to love the color 9 1/2 A: the lightest Ash blonde, which is about 3-4 shades lighter than my natural color. I have a tutorial for foil highlights here and a tutorial for random brush highlights here. 2. Quick blonde refresh in between color treatments! For a quick root touch up or for some natural looking highlights I like to use SunIn! Yes, that stuff from the 90s! It still works! ;-) You can randomly spray it on your roots or wherever you like to get some highlights- or use this amazing trick: poor SunIn in a little bowl and dip a cotton ball into it and then do some streaks on your hair with the wet cotton ball! Then just sit a little in the sun- or even easier: blow dry it as this stuff activates through heat! Once a week use a purple shampoo that removes the brassy tones! I have used many purple shampoos (some of them were a fail like the Lee Stafford Blondes Shampoo - read here about it- I think cause it is more red-based than blue based which might be a better choice, if your hair got yellow instead of orange), but the Amika Bust your Brass is the best purple shampoo I have tried so far. It is much more a blue toned purple and I think this works best to fight the orange tones in your hair! This immediately removes any brassy tones! And it also smells absolutely delicious! Also: this stuff is super concentrated and you don´t need much of it! If you have super duper brassy hair, I recommend leaving the shampoo on for like 10 minutes (or even longer!). But always look in the mirror and double check, because if you have very damaged hair, your hair might even turn slightly purple- if you don´t want that, don´t let your hair soak too long with the shampoo. You don´t need to have the matching conditioner as the shampoo will do a fine job by itself, but I personally just like to use products that fit together and have the same scent. For immediate results - in case you just dyed your hair and are horrified by the result- try the Wella Color Charm Liquid Toner. I personally always have a bottle of the shade T18 in my bathroom in case I have an accident. You have to mix this with a developer (I use a 20% or here is a great set) and then apply it just like a hair dye. How long you leave it on depends again on how brassy your hair is! It could be anything between 5-30 minutes. I highly recommend looking constantly in the mirror and checking the color, as you will see the results immediately. 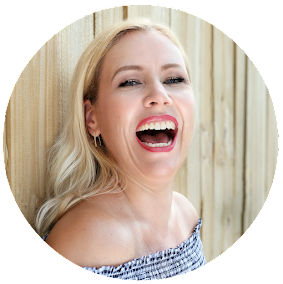 Wash out if your hair looks the right shade of blond- again: just like with the purple shampoo you can end up having purple hair! But don´t worry this will wash out after 1-3 washes. So there you go, these are my best tips on how to prevent or correct brassy hair!